Ea O Ka Aina: Where's the "eco" in ecomodernism? SUBHEAD: A techno-green future of limitless abundance sounds great, but it's totally unsustainable. 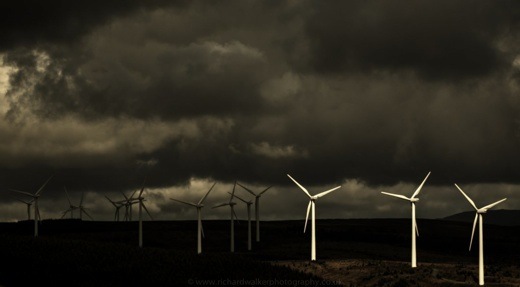 Image above: Windmills under an overcast sky. Photo by Richard Walker. From original article. If you hadn’t heard, despair is old hat. Rather than retreat into the woods, now is the time to think big, to propose visionary policies and platforms. So enter grand proposals like basic income, universal healthcare, and the end of work. Slap big polluters with carbon tax, eradicate tax havens for the rich, and switch to a 100% renewable energy system. In a recent issue on climate change in the Jacobin, several authors also suggested we need to consider carbon capture technologies, geo-engineering (the large-scale modification of earth systems to stem the impacts of climate change), and even GMOs make an appearance. What’s more, one of the contributors, Christian Parenti, actually proposes that we should increase our total energy use, not reduce it. Any critique of this kind of utopian vision is often dismissed as green conservatism. In her article, “We gave Greenpeace a chance”, Angela Nagle argues: faced with President Trump promising abundance and riches, greens can only offer “a reigning in of the excesses of modernity”. This argument is associated with an emerging body of thought called ecomodernism. Ecomodernism is the idea that we can harness technology to decouple society from the natural world. For these techno-optimists, to reject the promise of GMOs, nuclear, and geo-engineering is to be hopelessly romantic, anti-modern, and even misanthropic. An ecological future, for them, is about cranking up the gears of modernity and rejecting a politics of limits. Like it or not, this attitude actually fits quite well with the socialist tradition. For Karl Marx and Friedrich Engels, modernity brought wonders and horrors. They argued the desire to go back to a feudal world of craftspeople and cottage industries was reactionary: their revolution would try to move beyond the present, not before it. Fully Automated Luxury Communism (FALC), is the embodiment of this kind of maxed-out modernism, rebranded for the 21st century. But, given that we are fast approaching the planetary boundaries of the capitalist system, is it really that reasonable to suggest that now is the time to power up the automated factories? In his article “Fully automated green communism”, Aaron Bastani, one of the main proponents of FALC, tries to respond directly to this kind of criticism. For him, eco-modernist socialism can be sustainable, too. “[T]he idea that the answer to climate change is consuming less energy – that a shift to renewables will necessarily mean a downsizing in life – feels wrong. In fact, the trends with renewables would point to the opposite: the sun furnishes our planet with enough energy to meet humanity’s annual demand in just 90 minutes. For eco-modernists like Bastani, the problem is not technology itself: the problem is who owns it. When asked if his techno-optimism doesn’t understate the reality of climate change, Bastani responds that any tool can be turned into a weapon. Technology is only violent in the hands of a for-profit system. The thing is, there’s very little “eco” in eco-modernism. Ecology is about the big picture: understanding the relationships between people, animals, plants, materials, and energy—how they co-evolve and are interdependent. So, for an ecologist, any technology cannot be understood as separate from the context that created it. In contrast, eco-modernists see technology as simply a tool, which anyone could pick up and use. Their modernism becomes “eco” when we take the machines of modernity and use them to decouple society from nature. This is certainly the case for nuclear power. Anti-nuclear activists point to the harmful effects of nuclear radiation and accidents, but, as ecomodernists point out, coal has killed more people historically and will kill many more if we don’t do anything soon. The only thing that can save us, they say, would be to replace the fossil fuel-based energy system with one dependent on nuclear power—which in turn would require large state subsidies and centralized planning. We have the technology for a low-impact energy system, we just need the political will. Sounds simple, but let’s look at the big picture. Nuclear power requires a regime of experts to manage, maintain, and decommission; a centralized power grid; large states to fund and secure them; and, then, a stable political environment to keep the waste safe for at least the next 10,000 years. The technology is only 80 years old, modern states have existed for about 200, humans have only been farming for 5,000, and most nuclear waste storage plans operate at a 100-year time-span. To put it mildly, an energy grid dependent on nuclear means having lot of trust in today’s political institutions. The problem with nuclear clearly isn’t technical, it’s political. The prospect of scaling up nuclear to the level needed to replace fossil fuels begs two questions. First, are our political institutions robust enough? Second, do we want the world that nuclear creates? A world full of nuclear power plants is a world of highly centralised power, an energy system removed from people by an army of specialised engineers and, to protect it, a maximum-security state. To think that any technology can be grabbed out of the current system and scaled up without consequences is a profoundly un-ecological idea. “There’s nothing wrong with the ‘100-percent renewable’ part… it’s with the ‘100 percent of demand’ assumption that [scientists] go dangerously off the rails. At least in affluent countries, the challenge is not only to shift the source of our energy but to transform society so that it operates on far less end-use energy while assuring sufficiency for all. That would bring a 100-percent-renewable energy system within closer reach and avoid the outrageous technological feats and gambles required by high-energy dogma. It would also have the advantage of being possible. The idea that there will be so much solar energy that “we won’t know what to do with it” also merits a second glance. True, solar energy is practically infinite. But unlike the alternatives, it’s dissipated and difficult to collect, transport, concentrate, and store. It’s like trying to catch the rain when you’ve spent the last two hundred years drawing water from enormous underground reservoirs. It would mean more than democratising ownership of technology, but a total reboot. And even if we were able to press that restart button, this luxurious future would require infrastructure, land, resources, and energy to build. These are unfortunately not super-abundant, but, by definition, limited. Simply grabbing technology from the machine of profit won’t solve this problem. It’s here that we’re forced to really think through the ecological position. Capitalism, as Andreas Malm argues, was built on coal and oil, and is inextricable from it. The extraction and burning of coal made the creation of the working class possible, and it generated new forms of hierarchy and inequality. In other words, any technology developed in the current system isn’t neutral—by its very design, it shapes relationships between people and nature. Being an ecologist today certainly doesn’t mean refusing to improve humanity’s lot, but it also means having a real conversation about the limits we face. And if an alternative system is to be at all ecological, it would mean democratically weighing the costs and benefits of different technologies: which ones we want, and which ones we don’t. That’s not anti-modern, that’s a basic requirement for a better world. So how do we get out of this mess? Now, more than ever, we need visionary proposals and new imaginaries. But, with the ecomodernists, this gesture to “think big” gets taken to the extreme: any “buts” and you’re branded as, basically, eco-Thatcher. Today, breathless modernism—the refusal to collectively discuss limits—is no longer tenable. The dismissal of any political discussion of limits has real costs; Ironically, modernity without limits will send us back to the dark ages. For Andreas Malm, there is only one option. If we want to avoid a new dark age, we can’t just collectivize the grid. We have to dismantle it and build a new, very different one. And if those driving the train of modernity can’t see the catastrophe up ahead, we’ll need to pull the emergency brake. Politics is the collective deliberation of the future we want. It follows that we would also need to debate the things we really don’t want, the things whose price we refuse to pay. Without this kind of discussion, we’ll never have a truly sustainable society. Talking about limits isn’t constraining, it’s liberating—perhaps paradoxically, it’s the basic requirement for building a ecological future of real abundance.